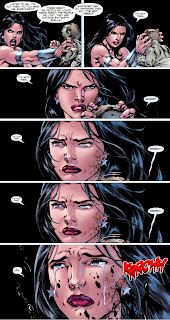 SPOILERS AHEAD: Sometimes I think if Wonder Woman was real, if she’d flatten the next person who asked ‘How her mission to bring peace can succeed if all she does is fight to achieve it.’ For Donna Troy, the former ‘Wonder Girl’ would just want to flatten someone for the needlessly confusing mess she’s been through, despite being one of the most fleshed out characters in the DCU. Infact I think the last time I read something that made me feel like the writer understood my favourite Titan 110% was in the Donna Troy ‘GirlFrenzy’ one-shot by Phil Jimenez – and that was way back in 1998! Now in a contender for moment of the year, BLACKEST NIGHT TITANS #3 by J.T. Krul, shows the only thing equal to the strength of Donna’s heart, is her conviction to do what must be done, as she crushes her zombified son in her hands. Thumbs up goes to Ed Benes to, who too often is attacked for only doing pin-up poses, but here rejects the gore to convey Donna's reaction to the horrific moment. Top that off with a vengeful Donna telling Dove to take her out if she starts to turn, and you not only make BN: TITANS the best of the Blackest Night tie-ins, you silence any critics who doubt if she had what it takes to join the Justice League in the months ahead. Well said - I posted pretty much the same thing on my blog this morning! Thanks Rich - and yours even has more pictures!! I wasn't sure about posting everything up visually but now I wish I had! While I'm on the subject of Titans I've got to throw out a shoutout to the legendary http://titanstowermonitor.blogspot.com for the three people who haven't found it yet - where a new member for Deathstroke's Titans team has just been revealed. Dan - I couldn't agree with you more. This mini-series was surprisingly good and a fantastic Donna Troy story. Really enjoyed it. Thanks for the encouragement Shag, coming from one of the guys who sets the standard for pop culture blogs that's really appreciated!